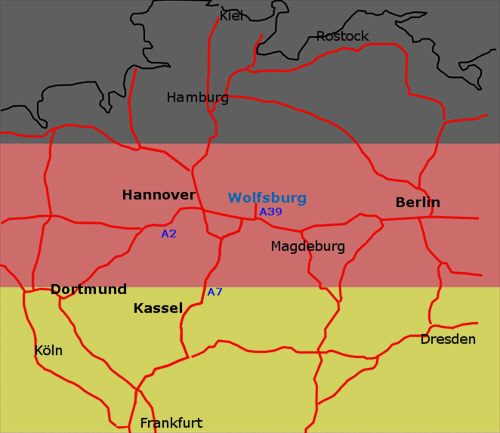 Take the A2 towards Wolfsburg (either in the direction Berlin or Hannover depending on if you are coming form the east or the west). 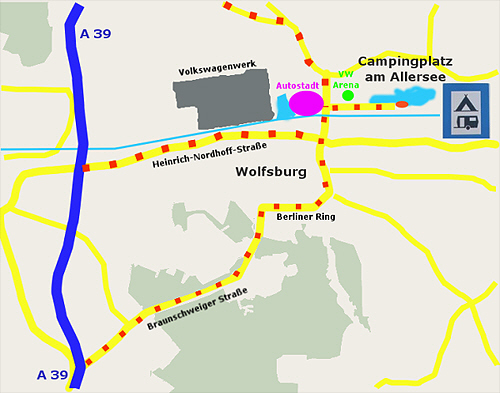 At the exit for the A39 (Wolfsburg/Könniglutter) continue in the direction of Wolfsburg. Leave the motorway at exit number 3 “Wolfsburg Zentrum (Autostadt)” and continue to driving straight ahead. After the tunnel/underpass take the left hand lane in the direction of the Autostadt. Don’t change lanes on the bidge/fly-over: after the fly-over follow the road to the right in the direction of the “Allersee Südufer”. At the roundabout take the second exit towards Allersee-Südufer “Campingplatz am Allersee”. Take the B4 via Hamburg, Lüneburg, Uelzen und Gifhorn at the exit Gifhorn North take the B188 in the direction of Wolfsburg. At the first crossroads in Wolfsburg (on the left side you’ll see the Schloß/Castle) head right toward the Autostadt. At the Autostadt head left underneath the bridge in the direction of “Allersee Südufer”. At the roundabout take the first exit towards Allersee-Südufer “Campingplatz am Allersee”. Wolfsburg is an ICE rail station and the journey with the train is an easy, relaxing experience. Our backpacker guests can reach the camping site by foot in approximately 15 minutes. From the Station follow the signs to the Autostadt. From the Autostadt keep following the Mittellandkanal (Middle Land Canal) for ca 1500 m toward the east (towards the VW-Arena / Allersee-Südufer). Keep the VW arena to your left and follow the road until you reach our camp site on the left hand side.